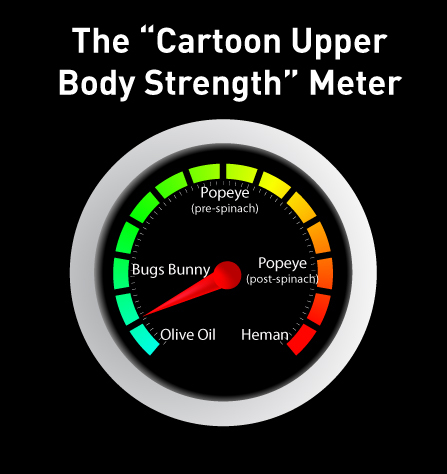 I do not have “blasted pipes.” I don’t have “fiery cannons,” “explosive guns,” or “screaming pythons.” As you can clearly see in the “Cartoon Upper Body Strength” meter, I’m sitting somewhere between Olive Oil and Bugs Bunny. For a dude in his twenties, that’s not good. Rule number 3 was developed to level the playing field. One guy in our challenge looks like he’s half rhino, and could easily do more push-ups in a two minute time period than anyone else. To even things out, we handicapped it so if you can’t knock out a pile of push-ups all at once, you’re allowed to do more sets in a day. For example: Rhino Man is only allowed to do 5 sets per day, while other participants can do 7. In theory, it makes it fair, but it takes more dedication from the weaker participants. We’re on our 4th day of the challenge, and my arms already feel like they’ve been repeatedly thunder punched. But more surprisingly, my abs are screaming at me! While the quest was for Stallone arms, the core strength benefits from push-ups are a great side effect. If I can still lift my arms high enough to type, I plan to track our progress on MillionIdeas.org. But in the meantime, wish us luck! Oh, and to all my co-workers that find me doing push-ups in hallways, elevators, and at my desk; I’m not insane, I’ve just got a challenge to win! If you’d like to hop on board the 31 Day Push Up Challenge, we’d love to have you! But to make sure you’re doing a proper push-up, here’s a quick video from our physical therapy expert and guest blogger, Colin Hoobler. I’m in! I just did my first set in the office. There was laughter, but it’s cool. They won’t be laughing at the end of December when I take them on in arm wrestling!